Healthy Cookware: What is the Best Cookware? Using healthy cookware is almost as important as the quality of the food you put in it. What's the point of spending money on high-quality organic produce if your pots and pans are leaching dangerous chemicals into your food? The best cookware is that which will keep you safe from contamination from dangerous metals and toxic gases that a lot of standard cookware contains. Good cookware is worth the money you spend for it. The first thing to replace is any aluminum cookware. I remember my grandmother (and even my mother) using aluminum pots, pans, pie plates, and baking dishes all the time. They were lightweight and conducted heat well. Unfortunately they also have been found to release small amounts of the metal into the body, especially when acidic foods are cooked in them. This can lead to all sorts of health problems, including anemia, decreased liver function, poor coordination, calcium deficiency and memory loss. It has also been associated with Alzheimer's disease, as many people who died with Alzheimer's were found to have had excessive amounts of aluminum in their brains. Next, get rid of all your non-stick pans. Now before you protest that you'll never be able to successfully cook a fried egg again without breaking the yolk, you should be aware that non-stick pans such as Teflon release a toxic gas called PFOA (perfluorinated chemicals) when they are heated above 500°F. And when the pan is heated further to 680°F, it releases at least six more toxic gases. PFOAs have been shown to cause a whole host of health problems, including infertility, damage to the pituitary, an increase in tumors and prostate cancer. The best cookware to use depends to some extent on what you are cooking. You can buy cast iron that is pre-seasoned, though cast iron seasoning is simple enough to do yourself and will save you some money. I have had my Lodge cast iron cookware for 20 years now, and it only gets better with time. I can fry an egg to perfection, with no broken yolks due to sticking to the pan, and it gives my pancakes a beautiful golden color. Cast iron heats your food evenly and provides trace amounts of iron to your diet. It is heavy though, so if you have difficulty lifting heavy objects you may need to choose another form of healthy cookware. An excellent alternative to cast iron is carbon steel cookware, which can weigh from half to two thirds that of cast iron, but provides most of the same benefits. It also seasons very quickly. I fried eggs in my de Buyer carbon steel skillet after only about a week of use and regular seasoning and they turned out perfectly, without sticking! Carbon steel cookware needs to be cared for in the same way as cast iron, though you can use soap on it once in a while as long as you are sure to thoroughly dry and oil it afterward. You can also use metal utensils without worrying about scratching the non-stick surface. Though both cast iron and carbon steel are good forms of healthy cookware, they are not recommended if you are cooking with acidic foods such as tomatoes (tomato sauce for instance), lemon juice, vinegar or wine, as it can give your food a metallic taste. In these cases you should consider either enameled cast iron cookware, high-quality stainless steel cookware, or ceramic cookware. 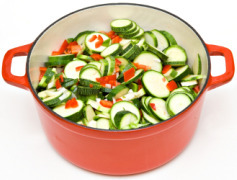 Enameled cast iron is healthy cookware great for anything that has to go from stovetop to oven. It works well in contact with an open flame and its metal handles are oven-friendly (assuming all parts of your cookware are made of metal). And the enameled surface will ensure acidic foods will not react with it. Its drawback is that it tends to be very expensive, but if you can afford at least one or two pieces I think you will find them worth it! The best stainless steel cookware will be high-quality 18/10 stainless steel that has a core of aluminum or copper (or both). While cooking directly on either aluminum or copper is unhealthy, having either metal sandwiched between sheets of stainless steel (or having a copper bottom) allows you to enjoy the excellent heat conductivity that aluminum and copper provide, while being able to cook your food safely. 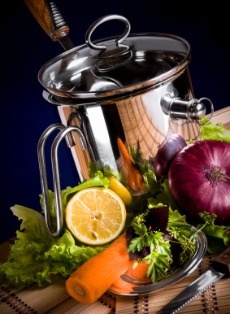 Stainless steel cookware is not non-stick, however, so they are often better for making sauces and soups, methods that use a lot of liquid. There are a few lines of Cuisinart cookware that are healthy and easy on the budget. Just be sure to stay away from the lines of hard anodized aluminum or hard enamel non-stick cookware, as they are not necessarily stable over time and with prolonged use. Glazed earthenware and ceramic cookware can also be excellent for baking, though find out from the manufacturer if their glaze is free of lead and cadmium. Some earthenware, particularly from Mexico and China, has been found to leach lead. A reputable manufacturer should ensure their product has been tested and found to be free from leachable heavy metals. An investment in healthy cookware is as important to your diet as making healthy food choices. But a few pieces of the best quality cookware you can afford and it will serve you well for many years.